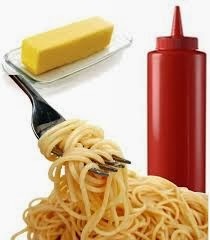 I was whipping up some cole slaw sauce today and panicked when I couldn’t find my favorite rubber spatula – the one with the end shaped like a spoon that extracts mayo from bottoms of jars as smoothly as a surgeon using robotic arms on an appendix removal. Garth flew to the kitchen when he heard my ranting noises above the shouts of the baseball game blaring from the television set. He arrived to find me frantically pulling items from the vintage-crock- turned-utensil- holder on my kitchen counter, using language that would put a drunken pirate to shame. After I explained my dilemma, Garth sighed on his way back to the TV, “I don’t know how you can find anything in that holder anyway. It’s jammed tighter than Dodger stadium on bobble-head give-away night." In a last ditch effort to find my special spatula, I spread all the utensils on the counter and went through the stash item by item, until – success! My treasured spoon-spatula was recovered and I was able to finish the slaw sauce like a Cordon Bleu chef. Then it dawned on me. The crock-on-the-counter was only one of the utensil holder places in the kitchen. That seven inch round crock held 5 wire whips (and I still can’t make a decent gravy), 8 spatulas (of which I use only two), 14 wooden spoons (including one shaped like a duck head at one end and ladle at the other), 2 pasta servers (one plastic with melted prongs), 3 wooden tongs (to extract hot bread from the toaster) and 2 wooden things shaped like rulers with notches that hook onto oven shelves so you can pull them out without burning your fingers or using a potholder). That adds up to 34 items – in one holder – just on my counter top. Since it was Sunday afternoon and I didn’t have anything better to do, I decided to take an inventory of some of my other utensils. Spoiler alert - this gets ugly, so if you have a weak stomach, you may want to stop reading. My regular utensil drawer is 34” wide x 21” deep. I won’t bother to list how many items are in there—I didn’t have a calculator handy—but suffice it to say I have multiple garlic presses, hand sieves, melon baller/cookie scoops, and all the other usual stuff, like 8 metal tongs, 12 mixing spoons and at least 6 spatulas. I did find a few fun items I’m not sure I've ever used…like a combination plastic orange corer/juice sipper, a butter press for corn on the cob and a bottle opener that’s shaped like a Moulin Rouge dancer’s leg (the one that plays the UCLA fight song when you open a beer is Garth’s). Exhausted, and feeling kind of dumb for spending my Sunday afternoon counting utensils in drawers, I gave up my futile pursuit before looking in the china hutch, pantry and garage cabinet, which I’m sure harbor more items I’m too embarrassed to admit I have. If you recall, awhile back I wrote about my friend, Ellie aka “The Gadget Queen”. Today I made a discovery about myself that may necessitate an apology to Ellie. If she is “The Gadget Queen”, then alas, I must be “The Utensil Queen”. 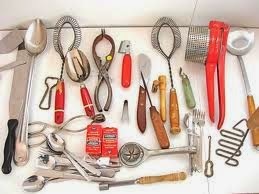 Although, if I looked thru El’s kitchen drawers, my guess is she could match me item for item...but that’s for another Snippet. 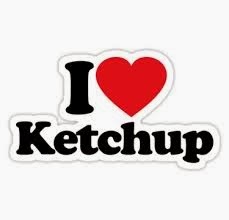 Today is National Ketchup Appreciation Day! Not really - but I, for one, think that luscious red goop deserves a special holiday to celebrate its deliciousness. On the culinary menu of life there are certain food items, such as French fries and onion rings, which should be deemed inedible unless they are accompanied by The Heinz. Trust me on this point. My palate for discerning the different brands of ketchup is (almost) impeccable. One day, hubby Garth, tried to trick me by setting up a blind taste test. I came home to find a series of bottles, sans labels, lined up on the kitchen table. It took me a short time to narrow the pack down to two finalists. Then the pressure was on. I hemmed and hawed, dabbed a bead of sweat from my upper lip. Unable to decide, I closed my eyes and pointed to my selection. In defense of my errant choice, I reminded Garth I had just finished eating a Burrito Supreme from Taco Bell and my taster was a bit off. He didn’t buy it. To this day he still revels in his small victory. I’ve determined my love of ketchup is hereditary. My Grandpa (born in the “old country”) used to swap his plate for a bowl, dump his dinner fare into the bowl, then smother it all with The Red. This sent my Mother running from the room to suppress her gag reflex. We didn’t have many dinners with Gramps. Now that you know the history of my love for ketchup, I‘ve decided to share three of my favorite gourmet recipes with you. This is a rare privilege, so do your best to keep them to yourself. Scramble some eggs. Top with ketchup. Yum! Brown some hamburger with chopped onions. Put into a flour tortilla. Top with cheese and ketchup. Roll up. Bueno! Take leftover cooked pasta (any kind). Heat in pan with butter. Sprinkle with grated Parmesan cheese. Top with ketchup. Mix all together. Bellissimo! I Coulda Been A (Red Carpet) Contender! I watched the Oscars the other night and while I do like trying to guess who’s gonna take home the statuette,my main focus is on what the celebs are wearing as they glide down the Red Carpet. Three hours before the actual start of the awards ceremony, I settled into my favorite chair, armed with a tall cold one and bag of Fritos to keep my energy up until dinner. Garth looked at me with tears in his eyes. Most likely because he knew I’d be holding the “big” TV hostage for the next six hours. “Why are you in front of the tube already?” he bemoaned. Hard to believe he even asked me that question. The man obviously hails from another planet. His head hanging in shame, Garth dragged himself to the “small” TV room like Dead Man Walking. Call me crazy, but ever since I drooled over Cher in a Bob Mackie, I’ve been obsessed with the Oscar fashions on parade. I’m so bad, I even go online the day after…not to recap who won what, but who wore what…just in case I missed something when nature called. Actually, I relish Google-ing to see if I agree with the fashionista critics choices of who’s dress was horrifying and who’s look was “all the rage”. What can I say? It’s an illness. Not that anyone asked my opinion (which they should have) but nothing popped for me this year. It seemed like either dark-colored gathered gowns or draped pale pastels reigned supreme for ingénues, oldies but goodies and pregnant presenters alike. There was definitely a bonanza of beads & bangles and a few token doily-dresses were thrown into the mix for good measure. Speaking of which, I do think Julia needs a new fashion stylist. Her black lace doily-dress-on steroids was borderline Maggie Smith in Downton Abbey and LaRobert’s choice of wearing a man-shirt stuffed into the top of her strapless gown to the Golden Globe awards left much to be desired (guess Whoopi missed that memo). But I digress. The 2013 ensembles were definitely more fun to critique. I didn’t notice any wardrobe malfunctions or peek-a-boo-boo dresses this go-round. And the only thing that came close to Melissa McCarthy in a gray draped tent last year was Liza Minnelli in an electric blue pajama set. However, the matching streak in her hair definitely added the missing pizzazz element …. not! Those are all the meeeoowwws for now. But I’ll let you in on a little insider secret. Well, it’s not that much of a secret, really. I’m sure you already know that some of those stars get paid beaucoup bucks to wear those clothes and tout the designers who fashioned them. Shocking! Still, if I had access to Dior Haute Couture, Vintage Valentino or even good ole Bob Mackie, I think I could do a little better…unless the price was right, of course. Meeooow.